Marble has always been associated with class and elegance. Cherished for its beauty, style, and charm, this tile has adorned the royal palaces of kings for centuries. There’s no doubt that marble adds value to a property and is being used as a luxurious option for upscale interiors not only in prominent areas of households, but also in personal utility areas like bathroom as well. However, though marble enhances the aesthetic appeal in the bathroom, it has in own downsides as well. Various maintenance issues have to be understood before the final purchase is made. Let's learn more about the pros and cons of the installation of this prized beauty in bathrooms before deciding on its mode of usage. Beyond doubt marble tiles in bathrooms are decadently beautiful whether they are used on walls, floor, shower, sink or as small accessories. Marble tiles in bathrooms have donned various upscale residences and give a sense of style by instantly elevating the space and giving it a royal rich look. Its multitude of palettes (richly veined, plain lines, dark colors like chocolate marble, black, etc.) and various shapes into which it can be cut and shaped allows for designing myriad complex designs. Every piece of marble is one of a kind, giving a unique appearance to any place where it is used! The translucent property of marble allows penetration of light and hence makes the tile glow in the sunlight. Marble is a good conductor of heat thereby allowing you to have a luxurious warm bath in winter. Marble is prone to scratches and can even be chipped if not handled properly. The higher the shine in marble the more pronounced would be the imperfections. Scratches cannot be set right except by replacing the entire material. Marble cannot withstand heavy chemical cleaning substances as it causes a chemical reaction upon contact with acidic substances. Hence any discoloration or deep stains that arise on marble flooring or tiles cannot be cleaned with harsh chemicals as the acid stains will be permanent. Marble is porous and allows penetration of water. It can thus get stained easily from colorful liquids. This can be addressed by applying chemical treatment below and above the surface sealer. However, sealing of marble tiles gives rise to another problem of water getting trapped beneath and thereby causing discoloration. Also, using sealers when not required will cause harm instead of doing good; hence sealers have to be used judiciously based on the type of marble. Not all marble needs to be sealed. Certain kinds of marble do not absorb the sealer. For these types, a sealer is not required because a stone that does not absorb the sealer will not absorb the stains as well, thus eliminating the need of a sealer. Hence if the sealer is applied to such type of marbles, then it may be counterproductive by creating a resin kind of substance on the surface, as it is not absorbed, thus diminishing the glow of the stone. Only certain varieties of marble, like for instance Carrara marble (a type of white marble) need to be sealed. Carrara marble contains minerals and iron deposits, and hence when used in a shower area, the frequent water usage may cause the metal deposits to rust over time and discolor the stone. Thus, sealer might not be apt for such types of marble. Due to its porous quality, marble floors have to be professionally treated every six to eight months to maintain its beauty and sheen. Marble in the shower may not sound a great idea as marble is prone to stains, for instance, hair dye stains, coloring stains, etc., due to its porous nature. Further, it is slippery and hence may not be suitable for elders. Good quality porcelain may be a better substitute for marble in the shower area. Good quality marble floors cost a premium as they fall in the high-end, sophisticated category. Sourcing good quality marble is difficult. Marble from Italy, for instance, belongs to the premium category and it is difficult to check and source genuine slabs. One may need the advice of an expert marble consultant to arrive at the right pick and also to know about its proper maintenance. 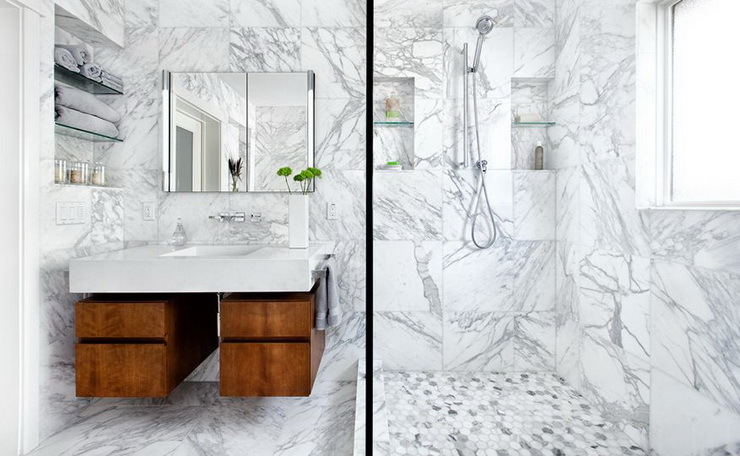 Here’s How You Can Incorporate Marble Into Your Bathroom… Without Any Issues! For those who love marble in their bathrooms but are wary of its downsides and have budget constraints, here is the quick fix guide to judiciously use this elegant masterpiece. Consider using marble subway tiles in small areas like the areas above the sink or in little larger spaces in the bathroom depending on your budget. You can add marble steps leading to a regular bathtub for that royal bath feel. Consider creating a marble surround for the bathtub to create that extra layer of charm. Marble can be used over the countertop for sinks. This is especially perfect where you have two wash basin sinks. Instead of using marble flooring, one can use this chic material on walls for dramatic impact. An impressive marble accent wall in the bathroom adds a royal touch of elegance. Incorporating a single marble wall in a simple bathroom makes a sea of difference in the bathroom design by adding a focal point and dramatic intensity. Use a combination of multiple textures and materials to invoke harmony in the bathroom. Marble can be paired with porcelain, wood or unique wallpapers as well depending on the budget. Another interesting approach is to cover the wall only halfway with marble. This creates a unique look and would bite less into your budget in addition to giving the satisfaction of incorporating a marble wall. Marble bathrooms are always in fashion. However, in addition to their eternal beauty, choice of right marble, appropriate usage, and proper maintenance will offer a healthy bathroom for that perfect relaxation. If you are looking to get your home completely redesigned, get in touch with Hipcouch today! Newer Post7 'Unusual' Tile Patterns That Can Make Your Home Unusually Awesome! Older PostFeature Wall: The Wall Your Home Doesn't Need... But Truly Deserves!